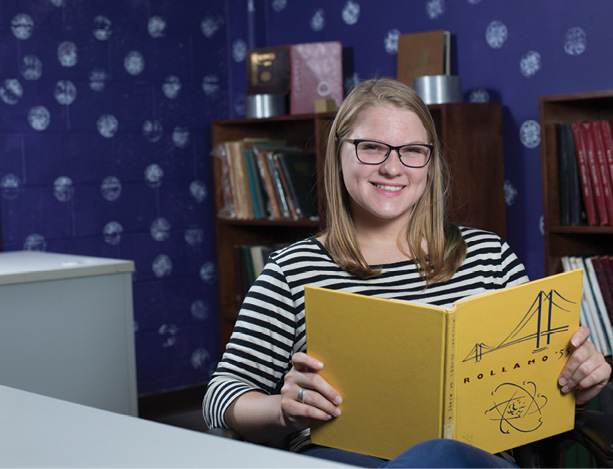 As a child, geology and geophysics senior Tegan Brand would often make the trek through the rolling Ozark hills to visit the banks of the Meramec River as it flowed through her grandparents’ farm in Steelville, Mo. “This stark contrast of wilderness to my otherwise suburban life was what encouraged my love for the natural sciences,” says Brand, who grew up in Watauga, Texas, a suburb of Fort Worth. Combining academics with extracurricular activities comes naturally to Brand, who expresses her more artistic side through her role as editor-in-chief of the Rollamo yearbook and a disc jockey at KMNR free format college radio. She also is a financial aid peer counselor, plays intramurals and is part of the C.L. Dake Geological Honor Society and the General Delegation of Independents.